Scotland Yard is trying to catch an important London drug cartel. They tend to do large trades worth more than 1 million great British pounds in several locations around London - mainly parks and cemeteries. 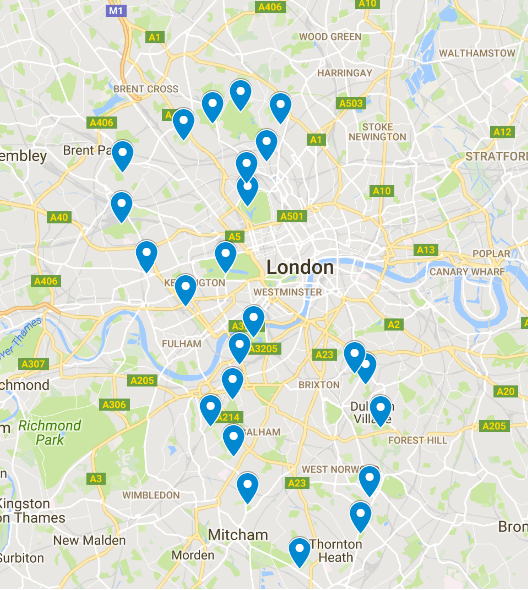 Through a network of informers the police have been able to map all the locations where they meet - and you can assume that drug dealers only meet at these locations. And here is a link for the map with the location names. The chief of Scotland Yard has assigned a very limited budget to catch this cartel. So each day they can dispatch, at most, a single Anti-Drug unit. The meetings always occur within a 24-hour window from the time the message is intercepted and always occur at the time settled on in the message. Now the Scotland Yard, decided to hire a consultant, YOU! Today (9-Sep-2016) they have just intercepted this message: " Meet at 9 p.m."
Can you determine where in London the meeting will occur? Step 1: Try to find out if there is a strong co-relation between the day of the week and active area. Thursday & Friday is always South Side of the river. Step 2: Try to find if on the South Side of the river, there is a co-relation with the time of the deal. It’s all the east side locations that show up post noon. Step 3: See how deals have happened in these areas post noon. 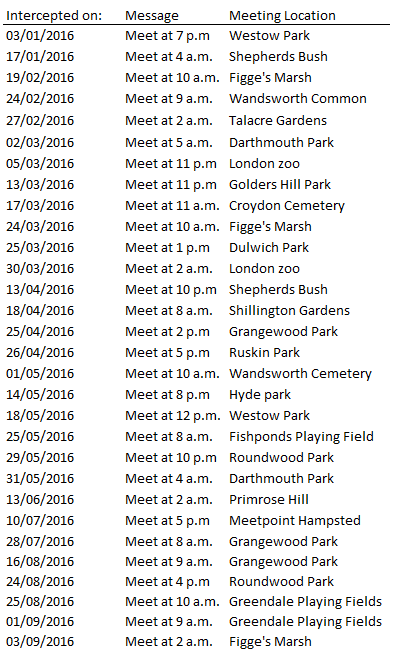 Peddlers had two deals recently in Greendale Playing Fields and non at Croydon Cemetery since March. So it's show time.